Loyola’s Institute for Ministry, or LIM, has been a leader in distance education for ministry since 1983. The Loyola Institute for Ministry Extension Program, or LIMEX, offers master’s degrees and certificates in pastoral studies and religious education through partnerships with local sponsoring agencies, such as dioceses, parishes, and retreat centers. The program takes place entirely on location in more than 40 places across the country and internationally. Loyola Institute for Ministry Director Thomas Ryan, Ph.D., says LIMEX affirms the vocation of all the baptized to ministry, whether in explicitly religious settings or in the world. It also responds to the need for education where people are because com- ing to campus in New Orleans is not always feasible. In January 2014, LIMEX will have its first group of graduates from Benin City, Nigeria. According to Ryan, Sister Cecelia Dimaku, M.P.S. 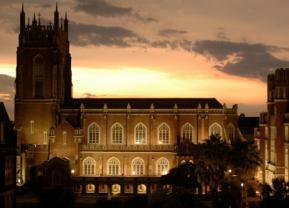 ’07, a sister of the Sacred Heart of Jesus, Benin City, received her master’s degree on campus in New Orleans and wanted the same education for her hometown. The Koch Foundation Inc., which funds Roman Catholic evangelization efforts throughout the world, generously gave Loyola a grant to pay for tuition, books, and other necessities to get the program running in Nigeria, Ryan says. The church in Benin City supplies a liaison to help admin- ister the program while Immaculate Conception College provides space for the group of 10 students to meet weekly. Moreover, students integrate their knowledge of the Catholic faith with their ministry. 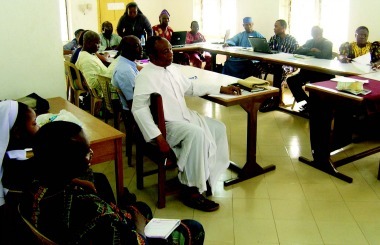 They develop ministerial proficiency by combining in-depth study of the Christian theological tradition with an appreciative and critical understanding of the contexts in which they minister. In addition, participants develop specific competencies in a ministry focus area of their choice. The students will graduate with the Continuing Education Certificate either in pastoral studies or religious education. Ryan uses four words to describe the LIMEX program: “Catholic,” “Ignatian,” “practical,” and “transformative.” It is Catholic in the sense of a particular way of being Christian but also in the lowercase sense, “catholic,” meaning “universal and open to truth wherever it can be found,” Ryan explains. Key to LIMEX is its Ignatian spirituality component, which was developed by a former Loyola professor, the late Father Jerry Fagin, S.J. Focusing on the graces of the “Spiritual Exercises” of St. Ignatius Loyola, students pray their way through the program. LIMEX as “education where you are” is practical in the sense that “it insists that students ask: ‘So what? So what does what I have learned mean for me, for my life, for my faith, for the world, and for the church?’” Ryan says. LIMEX in Benin City does not come without its challenges, Ryan says. One of the greatest has been how culturally sensitive the program has to be, making sure that the course materials and activities are attentive to and respectful of other cultures. However, due to the nature of the program and its model of the- ological reflection, students have the tools to be appreciative of other cultures and critical when these issues are not seriously addressed. Kate Trotter ’14 (marketing) is the publications and marketing assistant for the Office of Marketing and Communications.